African-Americans rightly are bringing focus to the deadly inequality of law and order in their country. Black Lives Matter is a perfectly good response. But the message gets twisted. Instead of asking directly and getting a direct answer, people start to project motives onto the “other”. (This “other” being their fellow citizens.) Choose a different form of protest, don’t block my roads! So Colin Kaepernick does, and instead of listening to his reasons, again people start to project motives onto him. He is against the flag, the country, the military!! The First Amendment means protest, but out of my sight. Trying to explain things is like tilting at windmills. 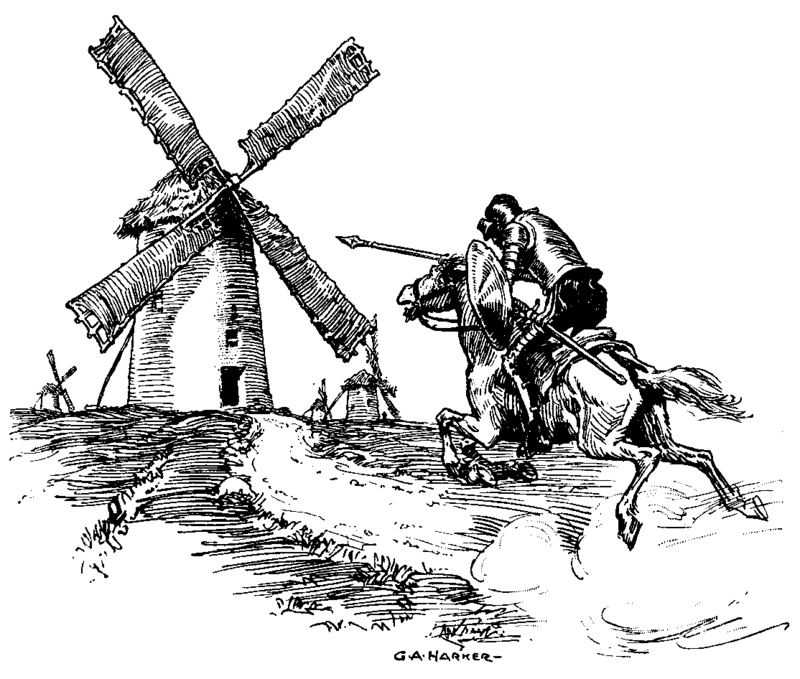 Don Quixote attacking the windmills, by early-20th-century illustrator G.A. Harker. The alt-right or whatever we should call them march saying Jews Will Not Replace Us. They are clear that white straight Christian males are the top of their pyramid. When people organize against those that represent a direct threat to their freedom and security, it is reframed as anti-white or the “same as” the alt-right but simply the other side of the coin. When people won’t listen, why talk? So I will talk about Sylvain and his Dogue de Bordeaux (this breed of dog, a French mastiff), a smallish man and his very large dog who hang out daily at Métro Place St. Henri. They were living with a group of people in subsidized housing. Last Saturday a fire took their living space. So now they are temporarily homeless (he plans to contact the city for a new housing placement). Yesterday, completely choked up with wonder, takeout food in one hand, a bag of clothes in the other, and his dog always by his side… he told me how there is a Facebook group with 200 people, and they have been seeking him out where he hangs out with his dog at the métro (subway) and giving him food, clothing, blankets, stuff for his dog, and are helping push his request at city hall. He spoke of how back in the day, St. Henri was égal (meaning equal), and I am sure it was. A working class neighbourhood where nobody was rich, but nobody was destitute, and neighbours would look out for a fellow on hard times. Sylvain went on to explain that now people that would normally not speak to each other in the street (as they are strangers) are meeting each other “at” him and his dog thanks to this Facebook group. He has become a meeting point unto himself even though he himself is wireless and phone-less, and as he added (though he didn’t need to, as it is obvious), he just loves hanging out there because he is a people person and he loves talking to and meeting people. The thing that we talked about at length was how the creeping gentrification has not ruined our neighbourhood. We both believe the actual strength of our community is its diversity. (Also our conversation kept switching French and English back and forth, as is natural in Montréal.) St. Henri is white, black, Chinese, Arab, French, English, gay, straight, young, old, Muslim, Christian, atheist, rich and poor – every category you want to sort people into. He has not found that the “rich” people are disdainful or judgmental of him at all, rather that many seem very invested in this community and all its inhabitants. Now, he is also a smiley personable calm person (and his dog is similarly chill) and he doesn’t really ask for anything, rather people give him things. While we were standing and talking on the corner a woman came up and pressed a ten dollar bill in his hand. He pointed to the sky almost tearing up as she walked away. So what can you do when the bigger world is so awful? I guess you try and make at least one small corner of the internet, or even better your own neighbourhood, a little brighter or more hopeful. Sylvain said he was feeling touched by the grace of God, and the people God was using were being rewarded by becoming more connected as a community. 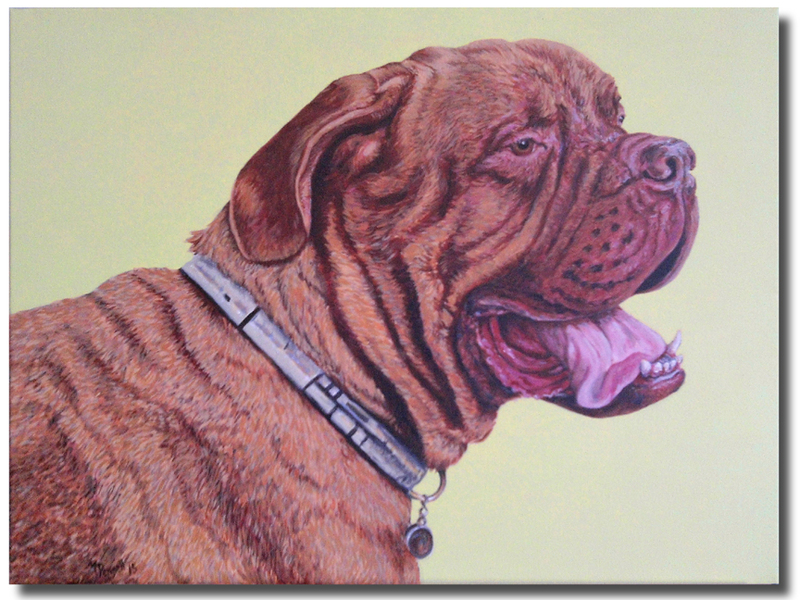 This entry was posted in opinion and tagged do the right thing, Dogue de Bordeaux, homeless, hope, St. Henri, Trump, truth, Us and Them, USA. Bookmark the permalink.